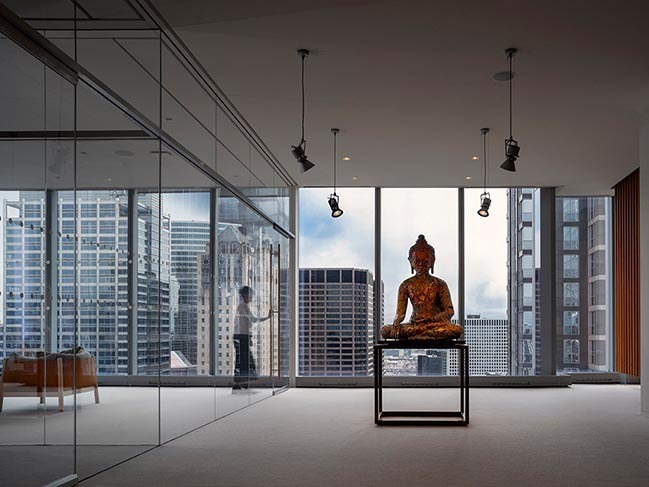 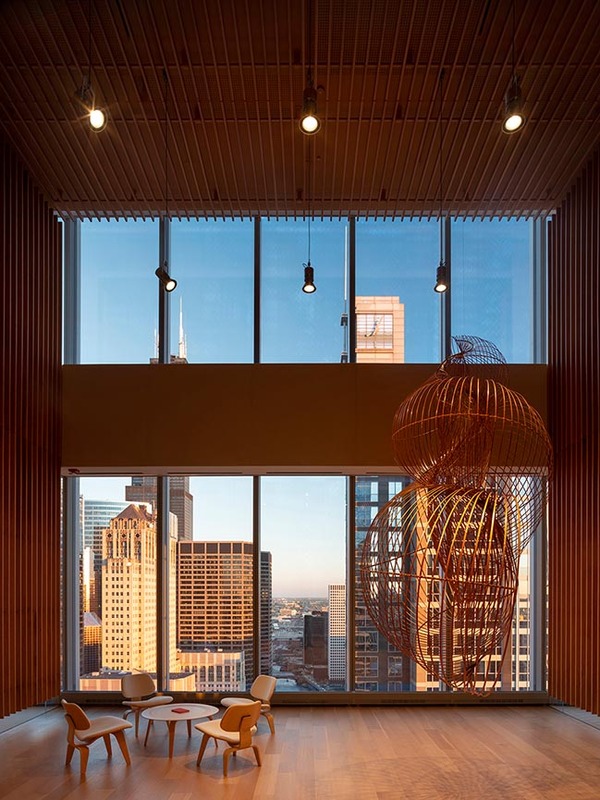 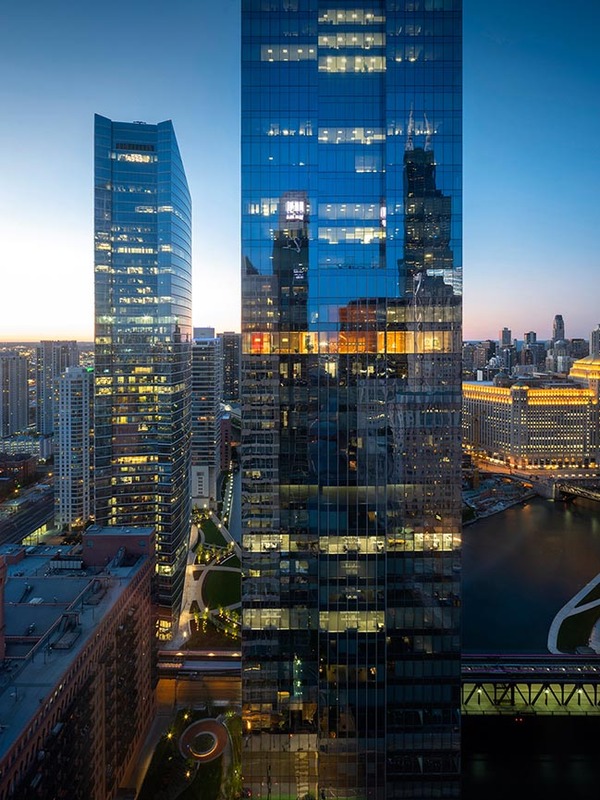 Suspended between the clouds, but firmly rooted in their surroundings, the executive offices designed by Rome-based architectural firm Alvisi Kirimoto occupy the entire 32nd floor of a newly built skyscraper in the lively ex-industrial district of West Loop, Chicago. 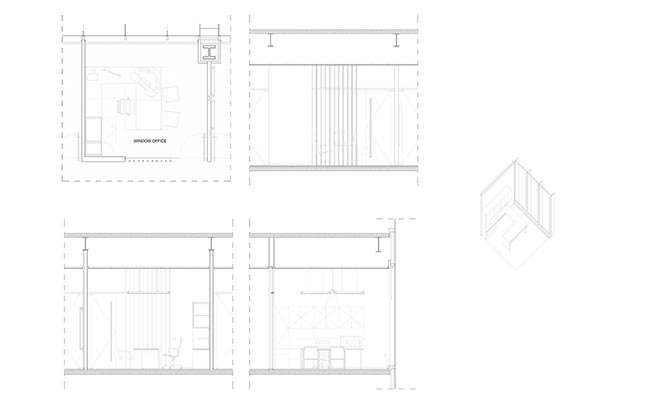 Gross square footage: 2,570 sq.m. 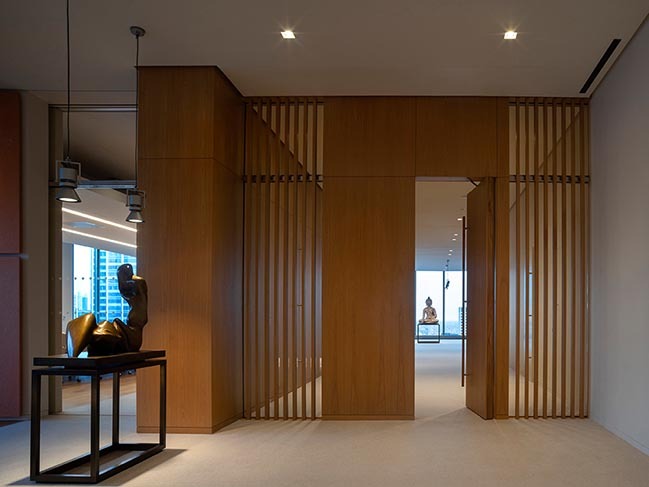 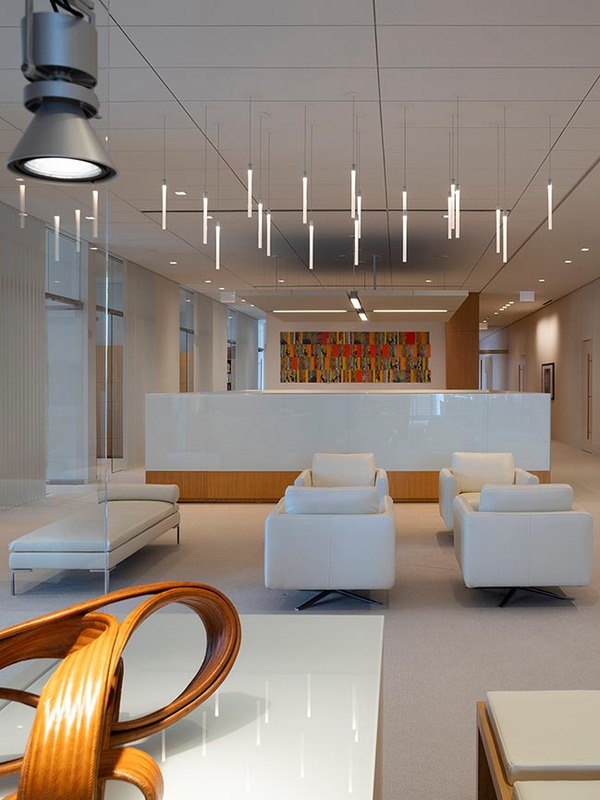 General contractor: Executive Construction Inc.
From the architect: The project, designed to accommodate the client's headquarters and showcase part of his art collection, fills an area of ​​2,600 sq. 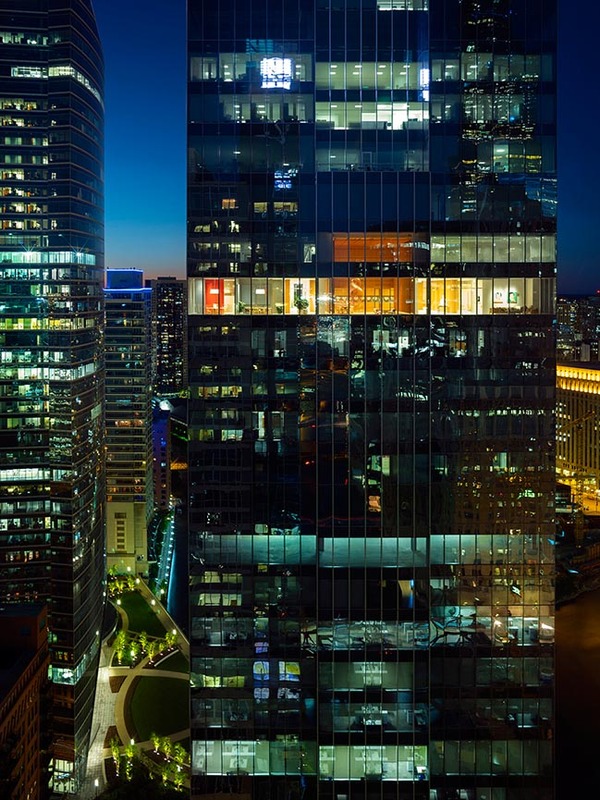 m, within a 224-meter high building located in the heart of the city, on the bank of the homonymous river. 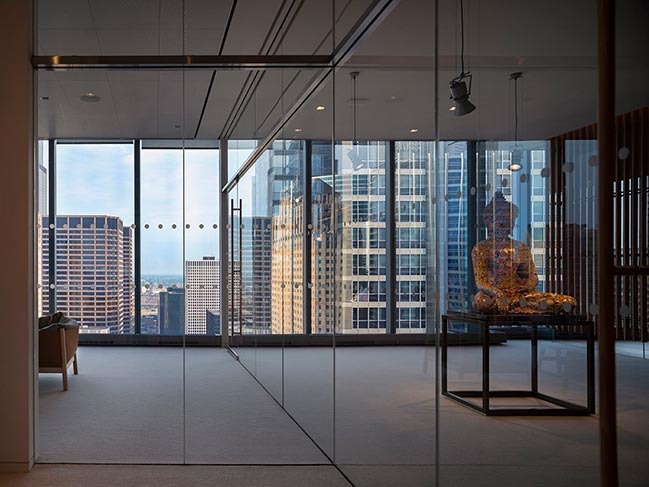 The architects Massimo Alvisi and Junko Kirimoto describe the experience of encountering the space, as follows: "The moment you leave the elevators, arriving on the 32nd floor, you feel as if you were immersing yourself again in the city - at a different height and perspective, of course, but with your feet well planted in the streets of Chicago. 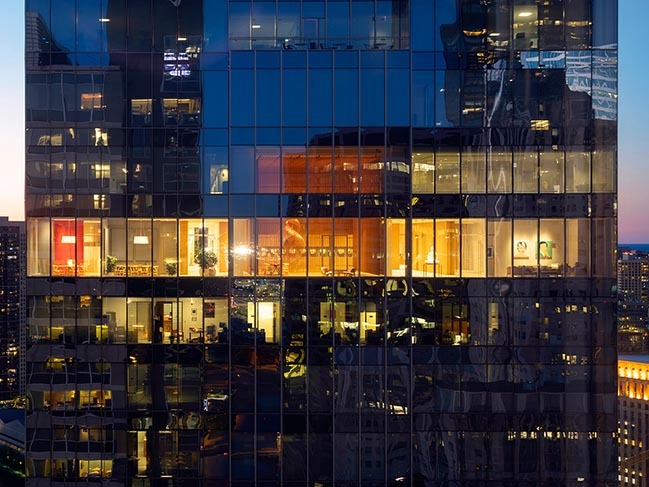 It is precisely the layout of the city with its surprises that we strive to project within this space: we stroll through pieces of contemporary and oriental art, or archeology, surprised occasionally by strong colors or the unusual double heights of a skyscraper, guided by the tight rhythm of the walls, the light and the visual axes. 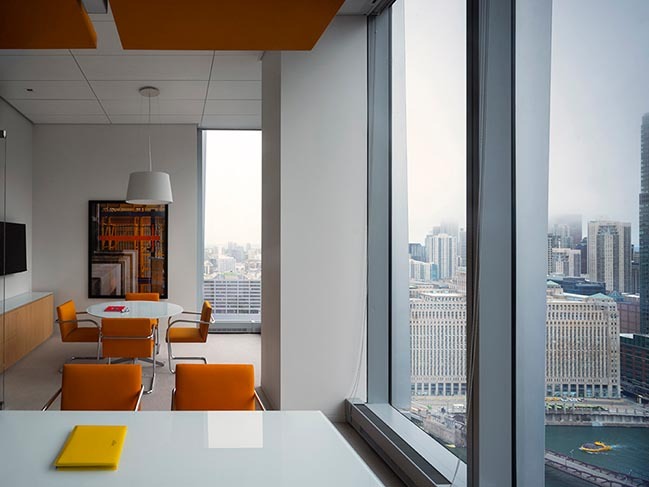 In fact, our first instinct was to leave the corners free to maintain constant eye contact with the city. " 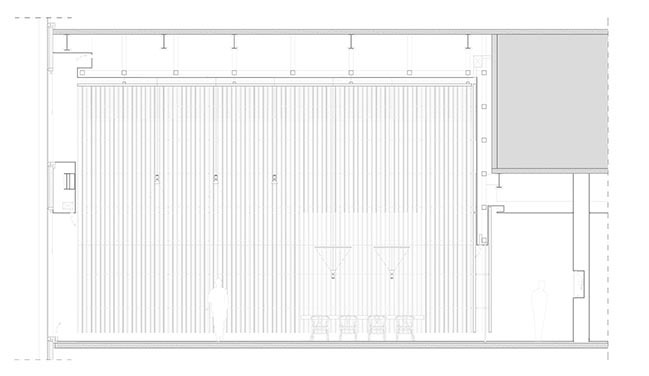 The main entrance to the building is located in its structural core, which encompasses all services and facilities. 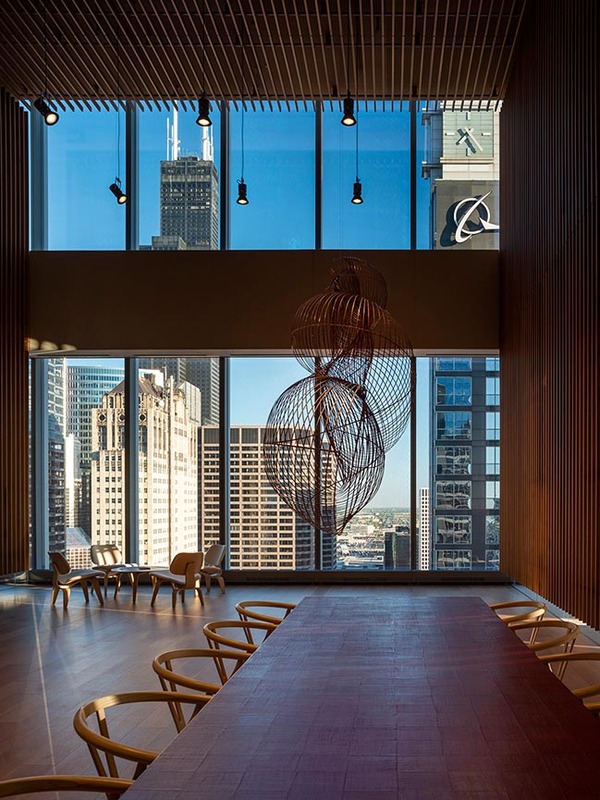 Two opposing rooms are immediately visible upon entry: on one side, the reception area and on the other, the playroom, both characterized by a large window that connects the visitor with the two faces of Chicago: the urban and the territorial. 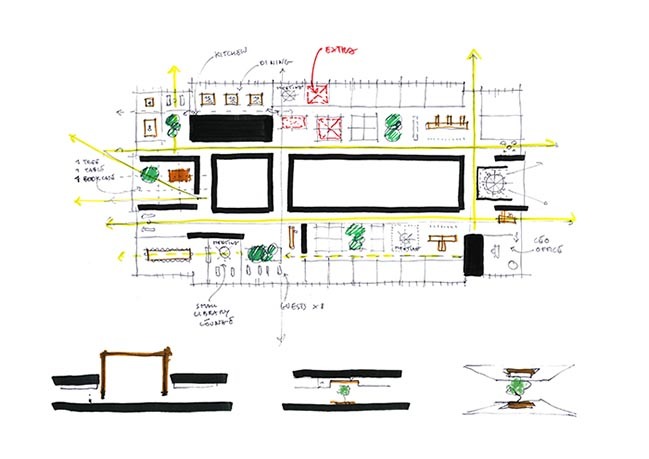 From a planimetric point of view, the North side hosts the most representative and aggregative functions such as the reception area, the meeting room, the Winter Garden, the exhibition routes and the restaurant area, while the South-facing side houses the private offices and some common areas. 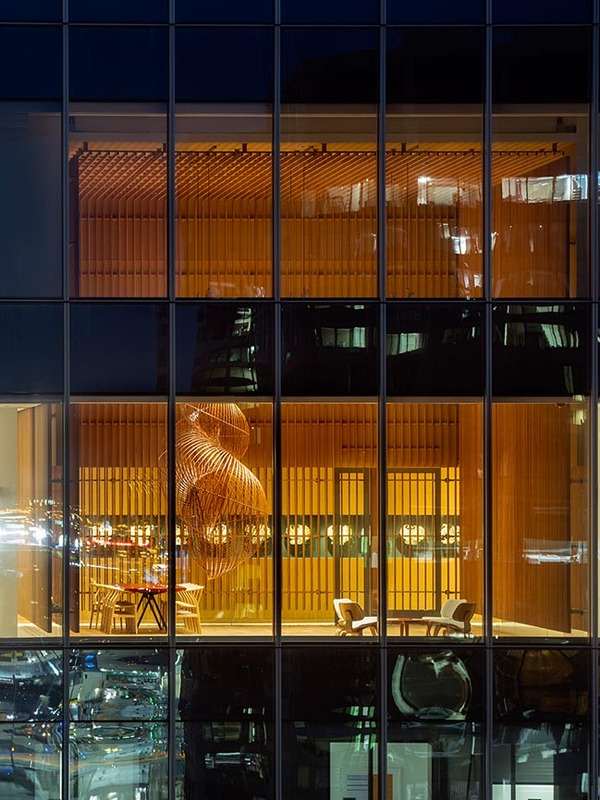 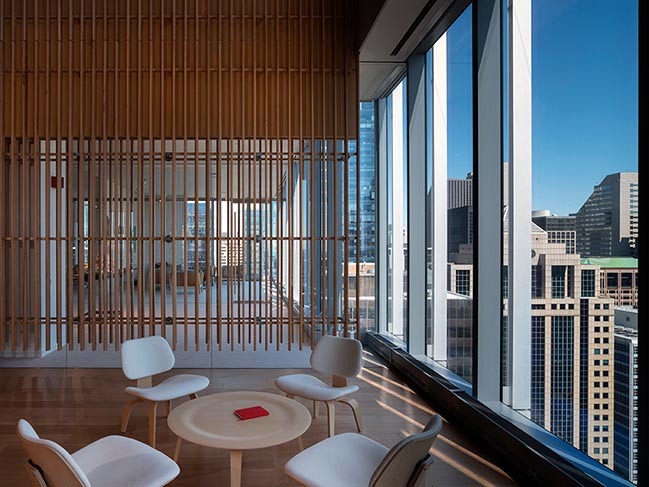 The interiors feature floor-to-ceiling natural wood walls, glass partitions and suspended panels, which, depending on the combinations, outline the different work areas. 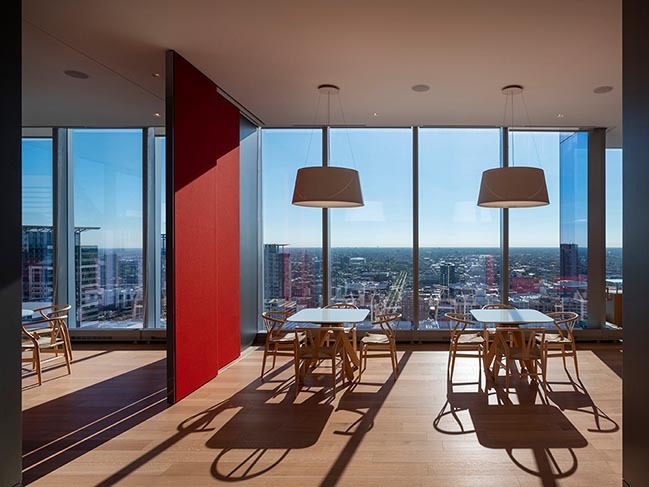 Great flexibility and transparency of the elements allows visitors and employees to enjoy breathtaking views even in the most private areas, which are delimited by opaque surfaces. 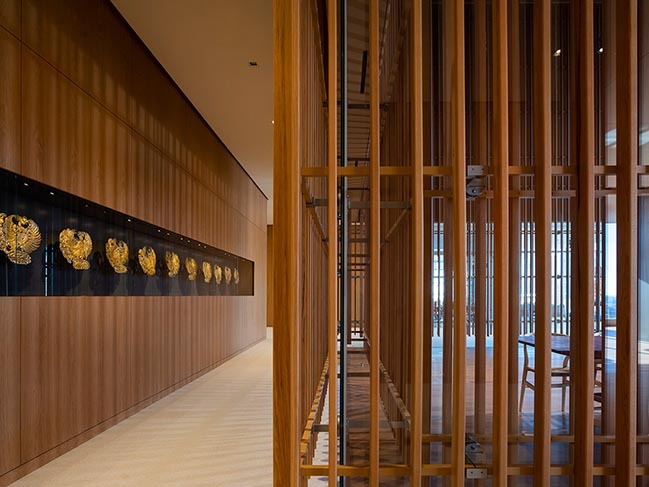 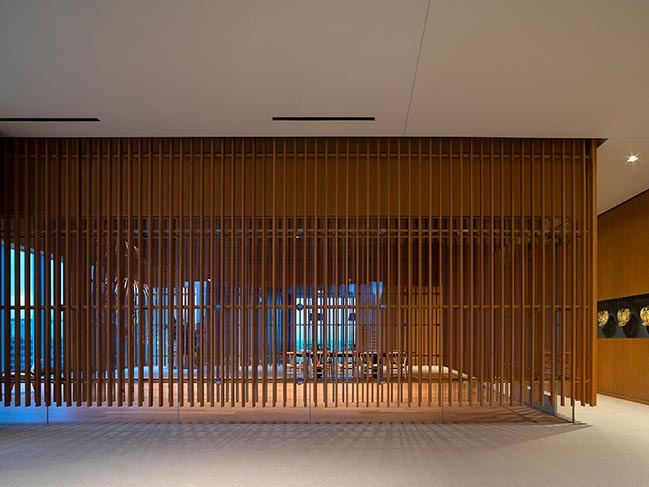 Wooden walls, which are dematerialized in vertical slats to calibrate the degree of privacy and brightness, characterize the main lines of the project. 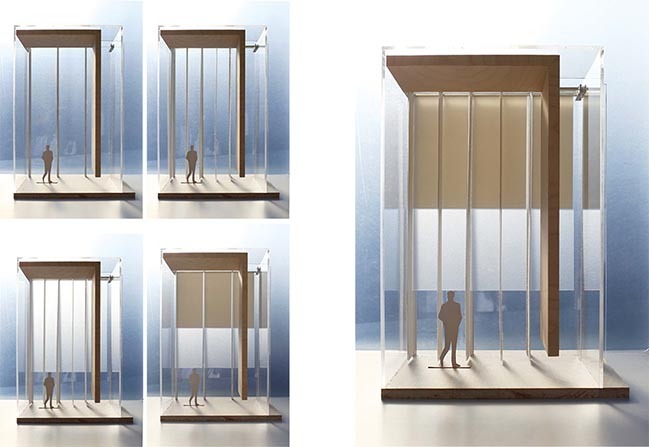 These constitute the leitmotiv that accompanies the visitor through to the discovery of the Winter Garden, a multi-functional double-height environment that represents the beating heart of the project. 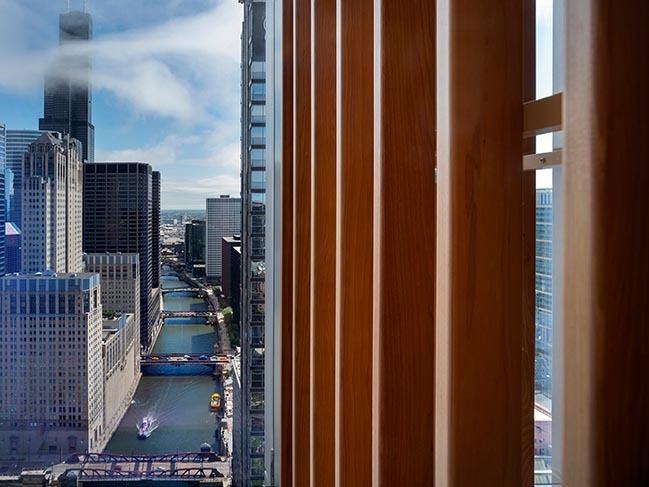 "From the structure of the Blues, a music that permeates the city of Chicago…", the Architects continue, "…we have taken the concept of 'Tension and Release'. 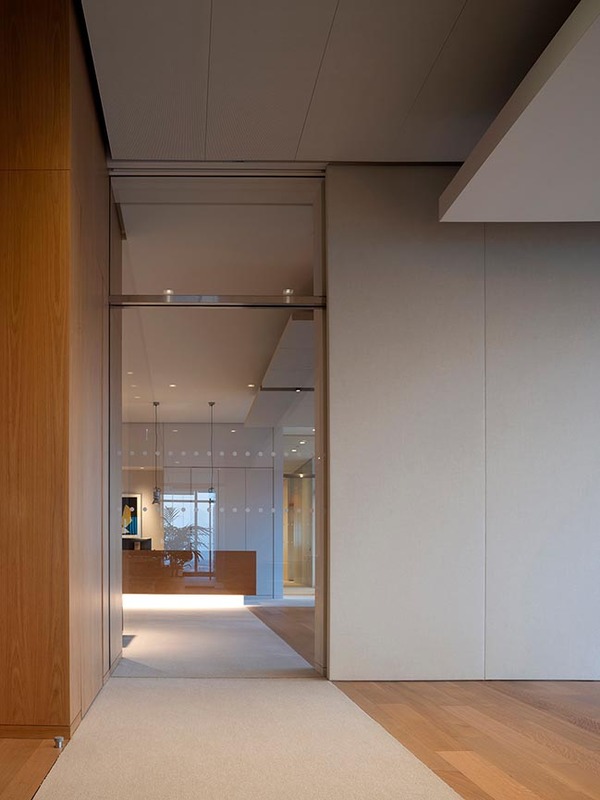 The 3,60 m ceiling height, which is absolutely extraordinary for an office, has allowed us to alternate suspended elements such as fabric panels, with sculptural elements resting on the floor and left at their original height. 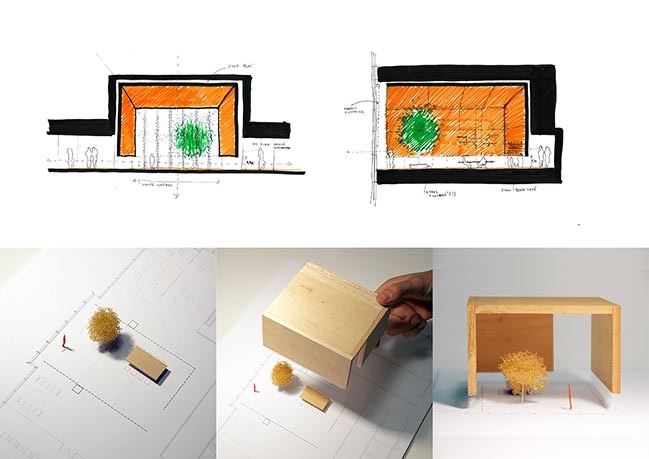 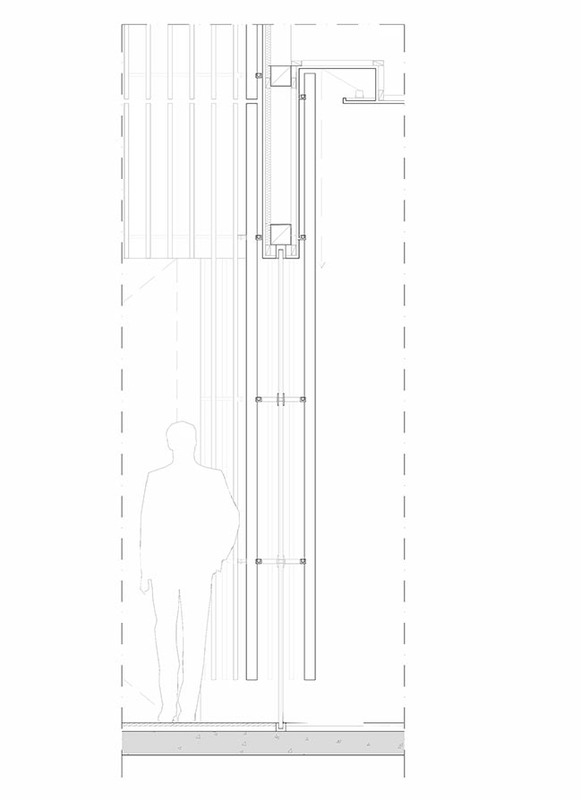 This compression and suspension game culminates in the volume of the Winter Garden: a unique space suspended in the city void, a material and tactile diaphragm that contains a space for music, art and events, as well as for meditation and reading." 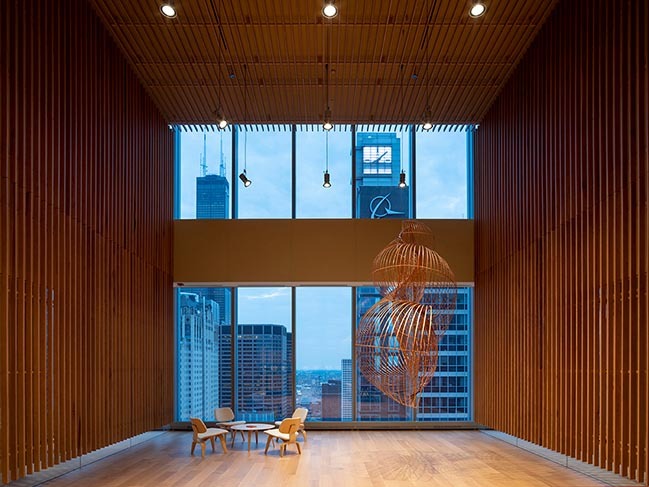 Depending on the point of view, the skin of the Winter Garden, composed of two rows of suspended wooden slats that do not align with each other, frame a central transparent glass partition, which, dissolves or becomes opaque, generating multiple perspectives and igniting an interesting game of lights and shadows. 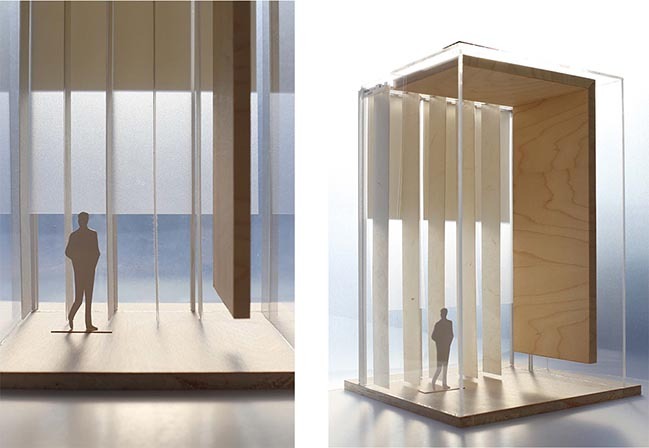 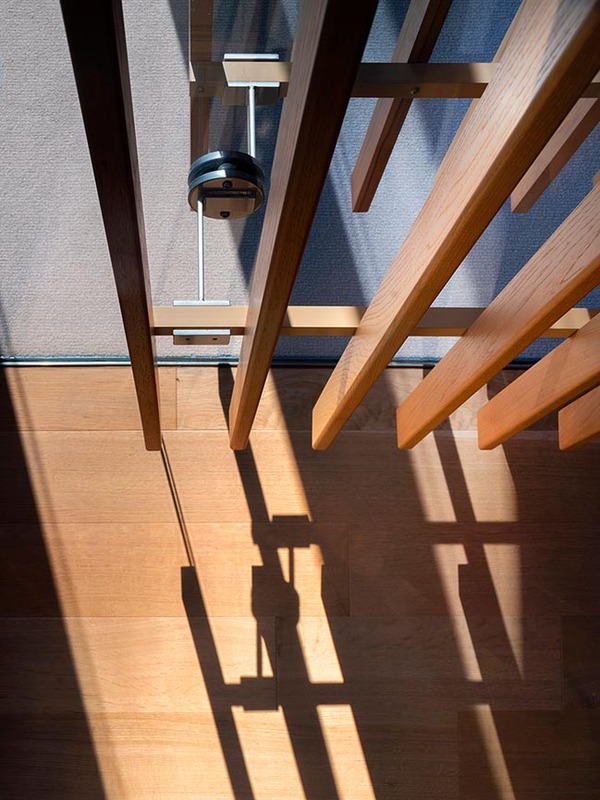 Similar to a light box, the environment allows the light to be directed through a system of double darkening and filtering curtains, and to diffuse the adjacent spaces with the wooden slats. 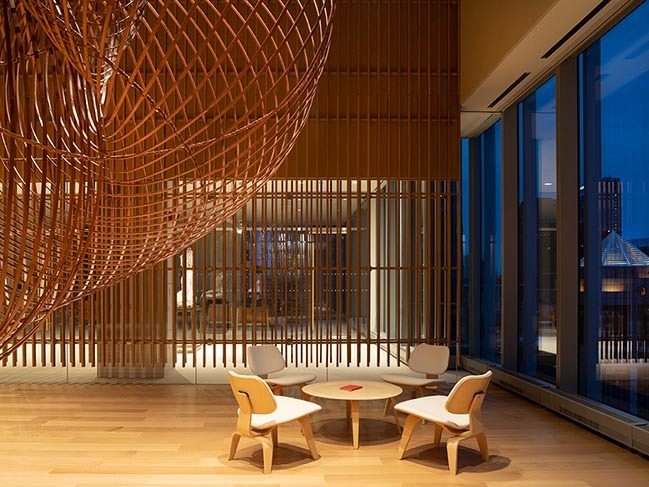 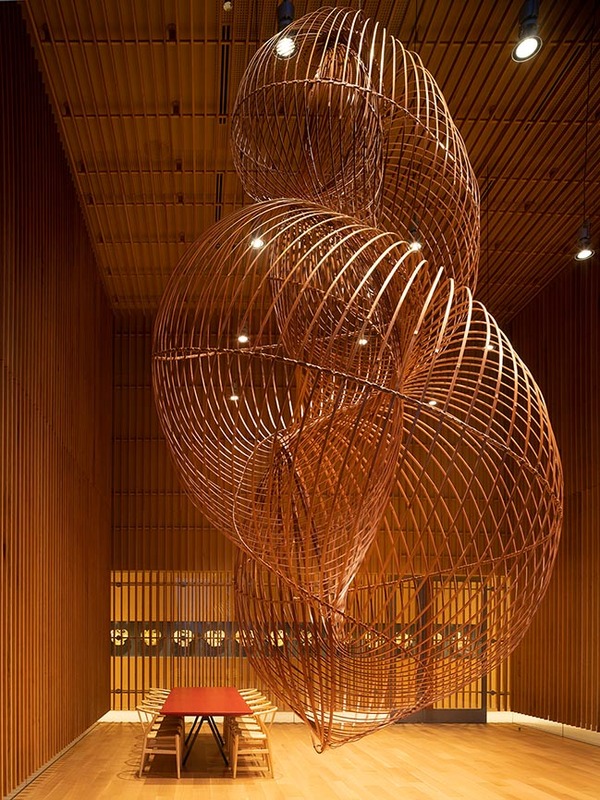 The room is completed by a bamboo suspended sculpture by Japanese artist Ueno Masao, and a table designed by Junko Kirimoto, with a Japanese lacquer finish. 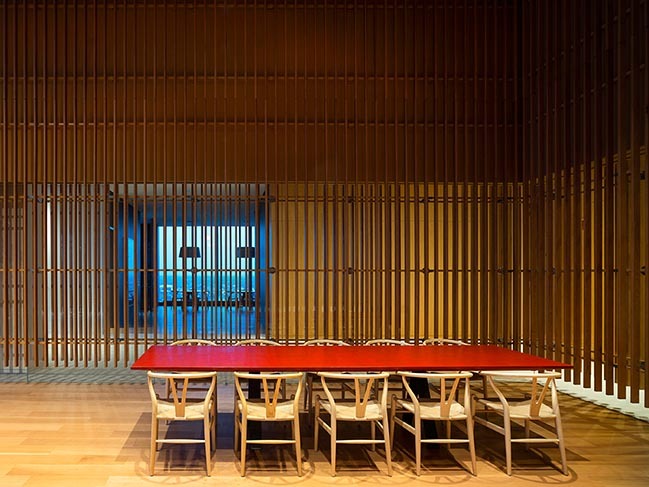 The space has an oriental touch and wisely measured proportions, in line with the Italian and Japanese sensibilities that animate the Alvisi Kirimoto studio. 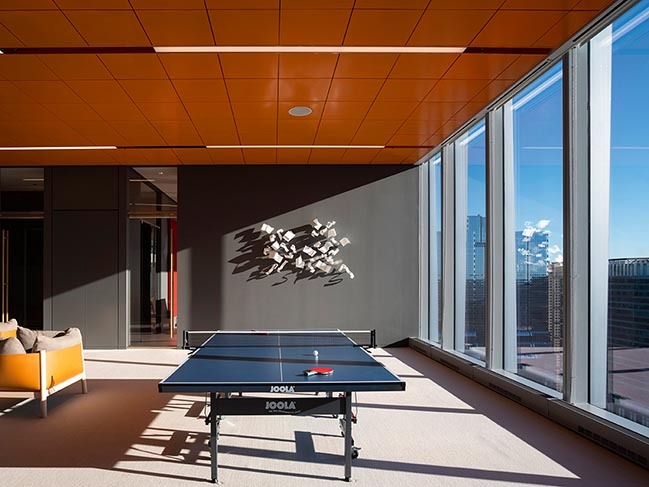 All aspects of the project have been carefully tailored and harmonized, from custom-designed furniture, such as the workstations and tables of the cafeteria, to the arrangement and choice of gradation of the lights. 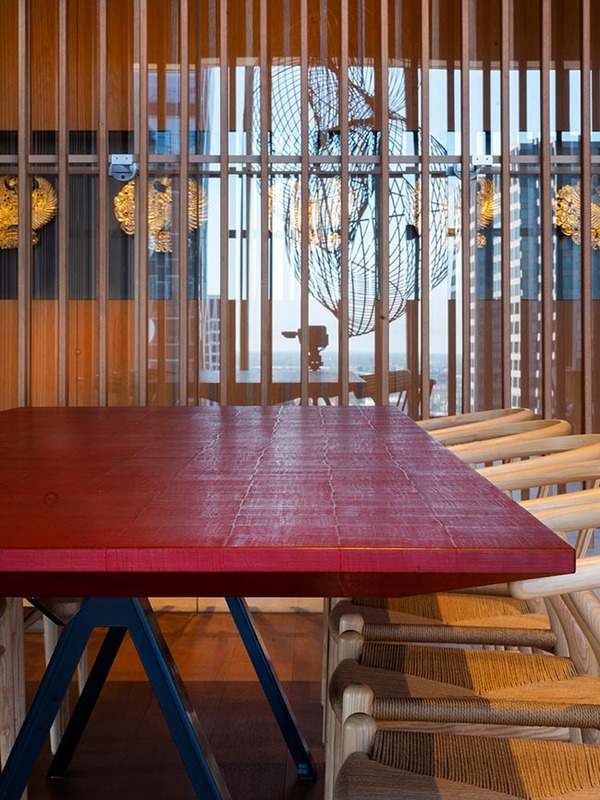 The use of color is weighted: at times it gives serenity, at others it draws space or defines a function. 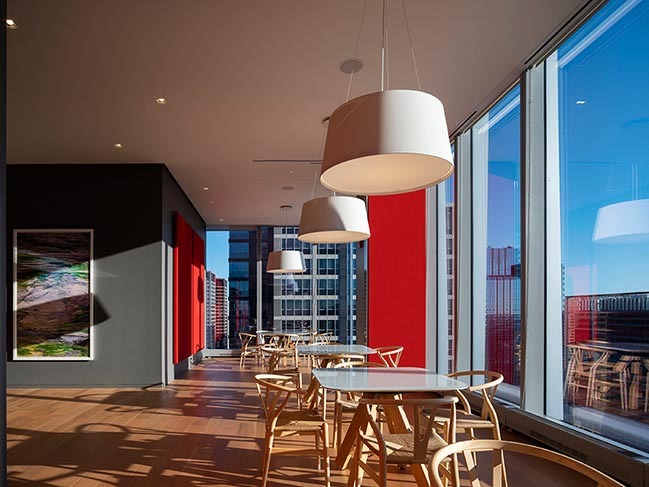 Colors range from the bright orange of the playroom ceiling and the suspended panels in the offices, to the intense red of the panels in contrast with the gray walls of the restaurant area, from the soothing rust of Japanese wallpaper at the entrance, to the regenerating white of the open workstation space. 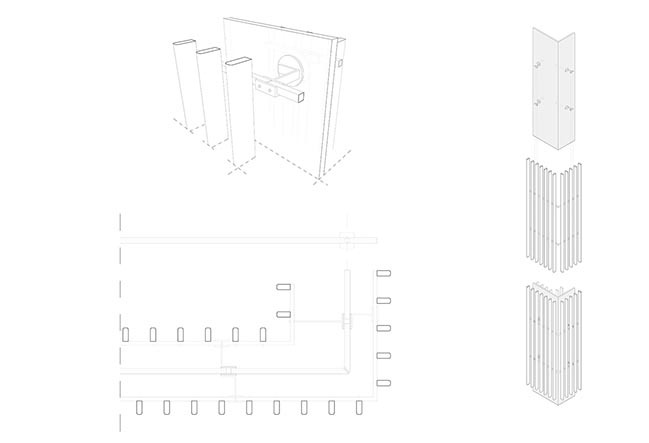 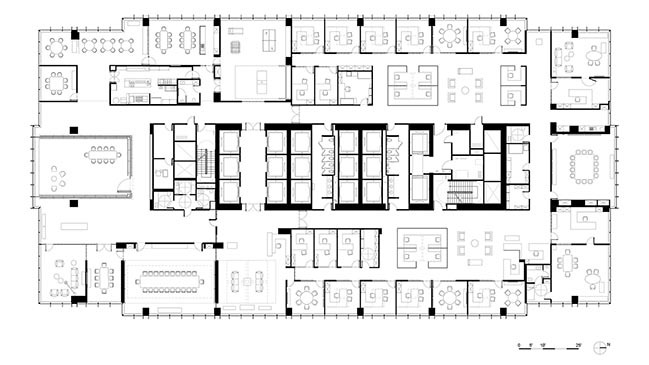 Last but not least, art plays a definitive role: the offices host a holistic exhibition path of over 1,000 sq. 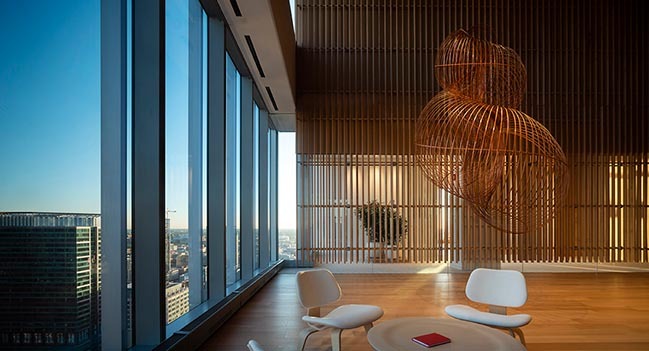 m dedicated to some of the client's collection pieces, in a succession of spaces that interpenetrate, overlapping with the city and generating unexpected and unconventional points of view.